This Basil Pesto Pasta with Broccoli and Mushrooms is an easy dish that’s full of flavor. 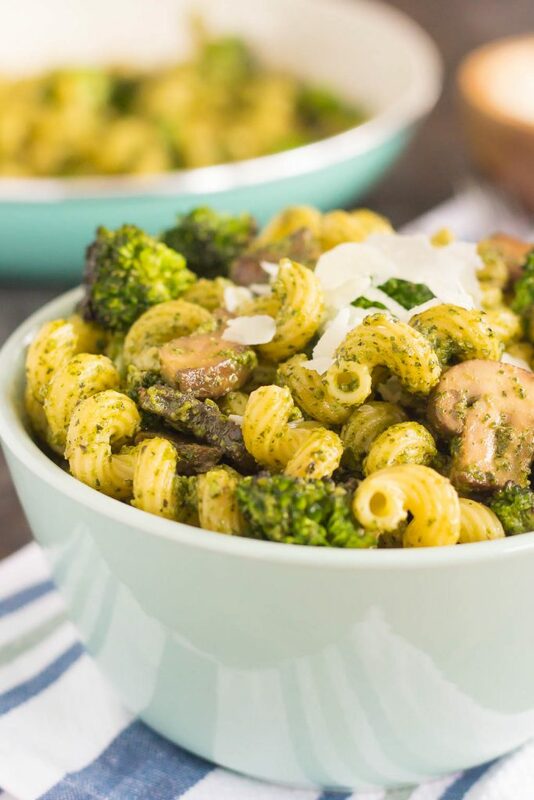 Tender pasta is tossed with basil pesto, sautéed mushroom, and fresh broccoli. It’s simple to make and is perfect for busy weeknights! It’s time for another 30 Minute Thursday recipe! Get excited, because I know I am! There are days when I need easy meals, and then there are days when I need carbs and easy meals. And today just happens to be one of them. The hubster and I just moved into our new house last weekend, so I’m pulling out all of the easy meal ideas that I can get my hands on! The kitchen was the first second room that I organized since I now have a ton of cabinet space and a gorgeous island! And my pantry…I could stare at it for hours, it’s so big that I need to buy more food to fill it! Ok, so that’s an exaggeration, but you get the point. I actually organized my walk-in closet first, because, you know…I love clothes and shoes, so I had to claim almost the entire closet, sorry to the hubster. But that’s ok, we have three other bedrooms to spare with lots and lots of closet space. And in case you didn’t notice, I love organizing! Shelves, closets, drawers, pantries…you name it! I also love cleaning and am a bit of a neat freak, so my kitchen always sparkles. But anyways, because we’ve been so busy unpacking, cleaning, and getting organized, easy meal ideas are definitely needed around here. And that’s when I had the brilliant idea to put my love for pasta, mushrooms, and pesto to good use. Remember when I shared this Easy Basil Pesto a few weeks ago? Well, I’ve been making it non-stop and freezing some jars so that I always have some whenever my cravings strike. And it really comes in handy since it’s already prepared, which is perfect for this 30 minute meal. If you adore pesto like I do, then this pasta is just begging to be made. And really, this dish couldn’t get any easier to prepare. Because, remember, I’m all about the simple dishes here at Pumpkin ‘N Spice. And when it’s summer and the weather is hot, I definitely don’t want to be standing around a hot stove all day. You’ll simply cook some pasta according to the package directions and set aside. I chose to use cavatapi noodles because I love their shape, but any pasta works in this dish. While the pasta is cooking, sauté the broccoli in some olive oil, and then add in some baby bella mushrooms to the same skillet. When both veggies are tender, add in the pasta and pesto, and stir to combine. And that’s it! Told you it was easy! You can use a store-bought pesto sauce for convenience, but if you have the time, please make this pesto…it’s SO easy and so good! One bite and you’ll be hooked on the tender veggies and zesty pasta. It’s flavorful, simple and perfect for busy weeknights or lazy weekends! This Basil Pesto Pasta with Broccoli and Mushrooms is an easy dish that's full of flavor. 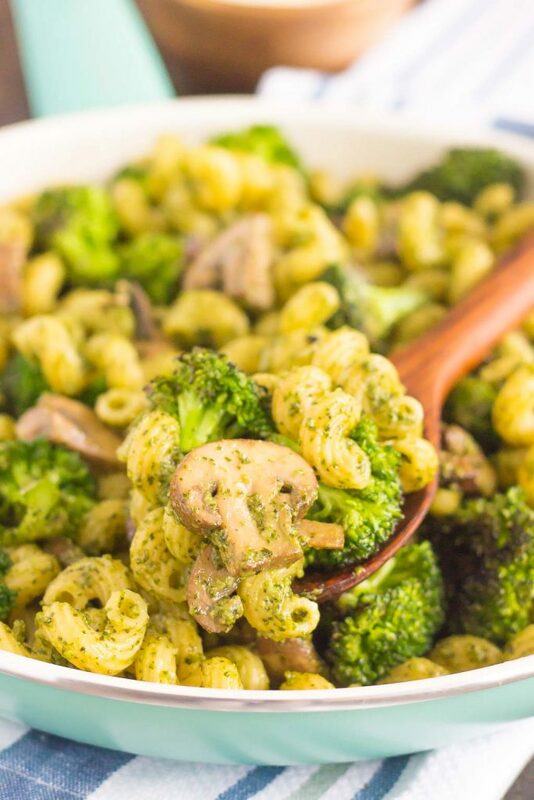 Tender pasta is tossed with basil pesto, sautéed mushroom, and fresh broccoli. It's simple to make and is perfect for busy weeknights! Cook pasta until al dente, according to package directions. Drain and set aside. While pasta is cooking, add olive oil to a large skillet. Add broccoli and sauté until just starts to become tender, about 4-5 minutes. Add mushrooms to same skillet and sauté until tender, about 5-6 minutes. Add more olive oil, if needed. Season with salt and pepper. Once broccoli and mushrooms are tender, add noodles and pesto to skillet. Stir to combine. You can never go wrong with pesto and pasta! I can add just about anything to that mix and my family will devour it. Love this easy dinner idea! Take ALL the closet space, Gayle. Leave him none!! We gals need it more. You know, for the shoes. Such a delicious, fresh pasta dish! I'm so into mushrooms in pasta. Happy dance! Meals like this are ideal for when you have moved house, or generally busy. 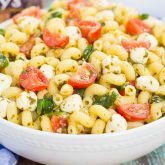 Pasta pesto is a staple for use during busy times too. Yes! Definitely great for busy times, Dannii! Gayle - This pasta sounds (and looks) delicious. I planted a ton of basil in my garden and can't wait to make this dish in the summer months! Thank you, Erin! Fresh basil is SO perfect for this dish! I like unpacking and organizing. But I don't like cleaning. I need someone to do that part for me! Glad to hear you two are getting settled. It always seems to take forever to get things all in order. I still haven't hung up all my artwork and I've lived in my house for a year now. Lol! Love this pasta. Carbohydrates and an easy dinner FOR THE WIN! Thank you, Liz! I'm slowly but surely getting there! And yes, carbs and easy meals for the win! I'm always a fan of pesto with pasta! Love this easy meal! Basically everything we have moved to the new house has been dropped just inside the front door....and we have lawn chairs in the living room. Red neck much?! hahaha! I am so envious of your moving skills! I am SO good when I have a plan but I haven't been able to formulate one...I just kind of put things in the car and then go drop them off. lol! This pasta looks AMAZING! I need good easy dinners like this this month! Haha I love the lawn chairs! We still have a lot to do as far as working on our basement, repainting, stuff like that, but for the most part, all of the big things are unpacked, and I feel a lot more settled. I'm just that type that can't relax until I have things my way, which isn't a good thing! I can't wait to see pictures of your house! And thanks for the pasta love, Annie! We moved in over 2 months ago, and I JUST organized my walk-in closet last week! The kitchen was my first thing to organize and I said the same thing about buying more food to fill up my cabinets! There is just nothing better than tons of cabinet space! 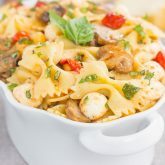 Easy meals are definitely a necessity during a move and this pasta looks just perfect. I am SO loving my cabinet space! I know I will have it filled up quickly though, because they say the more space you have, the more stuff you acquire! :) Thanks for the pasta love, Keri! Good luck organizing Gayle! It is so much fun! I would totally start with the closet, too! This dish looks perfect! So easy to make and delicious! Have fun organizing, Gayle! The walk-in closet and kitchen are the perfect places to start :) Easy and flavorful meals like this are so helpful when you just move. 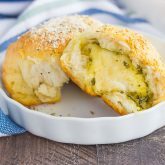 Looks delicious and I love that you used basil pesto here! Pesto basil pasta sounds incredible, Gayle! Love that this meal is so quick and easy. I'm so happy to hear you are getting settled into your new place! Thank you, Denise! It's so nice to have more space...I'm loving it! :) And thanks for the pasta love! Gayle, I just love this 30 minute Thursdays idea! What a wonderful theme for you and few other blogger friends. :) Goodness knows, we all need a bit more convenience to help us with our crazy schedules. Also, go you on organizing the walk-in closet first for the new house! Lol. I would so do the same thing--well, maybe a debate between the closet and the kitchen. Ha! Looking forward to more updates on the new house. Loving this basil pesto pasta! <3 Pinning, of course! Thanks for the kind words, Demeter! Aren't 30 minute Thursdays so much fun? :) I pretty much organized my kitchen right along with my closet...the two most important tasks! haha I took over pretty much the entire closet at our house too. The husband is always asking if he can have another shelf. Um nope, no you can't! lol This pasta sounds delicious! I can never get enough broccoli! Haha no more space for husbands! :) Thanks for the pasta love, Ashley! Easy meals are a must when getting organized in a new house, and Gayle, these are some of your prettiest photos! I love those close-ups -- I just want to dive in! These ingredients are all some of my very favorite, and carbs are always a bonus! Thank you for the kind words, Marcie! I'm in love with this pesto pasta! Mmm 2 of my favorite veggies in my favorite pasta sauce! It can't get any better! Love it! Thanks for the pasta love, Manali! That last picture definitely has me hooked! This is a perfect meal any night of the week - but especially on nights when you're as busy as you are these days! Happy Organizing!! Gayle, love this dish! I LOVE a good pesto in the summer and love the broccoli and mushrooms!!! Thank you, Alice! Broccoli and mushrooms make this dish so much better! Congratulations on the new house! I'm sure you are having tons of fun organizing! 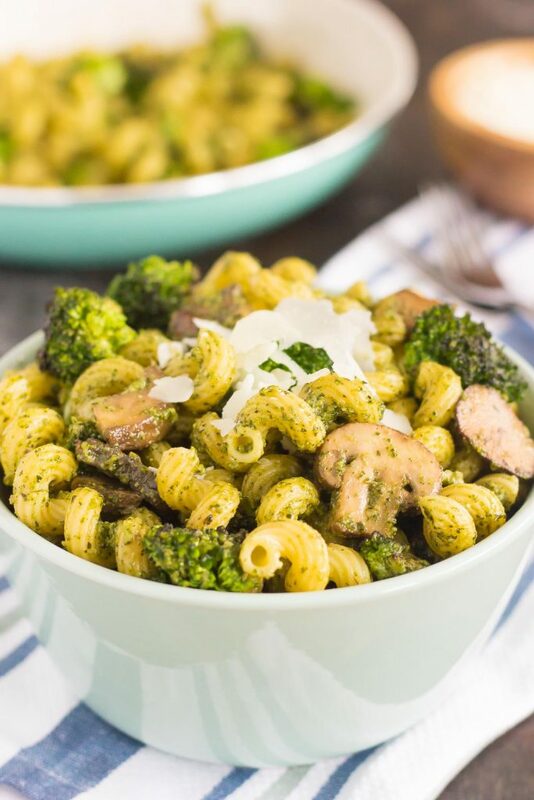 I love a pesto pasta and this mushroom broccoli version is so creative and looks amazing! Thanks for the kind words, Rachelle! So glad you liked it, Elda! Thanks for stopping by. What a great way to use the pesto. I seriously need to make a big batch of that. I like having things like that on hand for fast recipes. Sounds great! Congrats on getting settled in your new house, Gayle! That is so exciting! It feels good to get things organized, especially when you have more space to work with. :) This pasta is my kind of dinner! I love all of the veggies that you've packed in here, and I bet the pesto really brings all of the flavors together! Thank you, Kristine! It definitely is a great feeling to have more space! :) And thanks for the pasta love...the pesto just makes this dish even better! Pesto pasta is one of my favourite things, but I don't make it too often cause the rest of the family doesn't love it quite as much. Love the mushrooms and broccoli - this is calling my name! We move in a couple of weeks too so I'll be making it for sure! Good luck with getting all the moving stuff done! 30 minute meals are always good to have on hand! I'm a big pasta lover and this basil pesto version sounds soon delicious! Gayle! This looks amazing! I love that it only takes 30 minutes!! So perfect for summer! xoxo Cailee! Thanks for the pasta love, Cailee! Congrats on the new move!! 30 minute meals are CRUCIAL right now for sure. 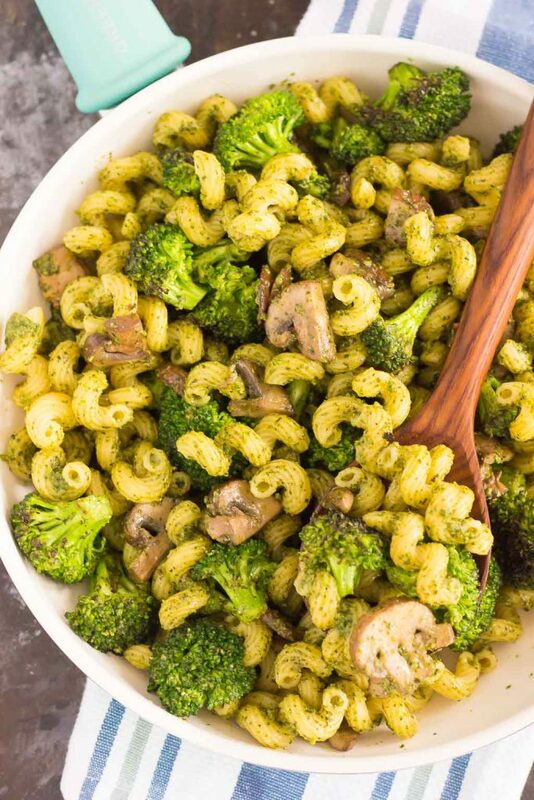 This pasta looks so delicious by the way - I'm loving the broccoli, mushroom, pesto...everything! Thank you, Jessica! 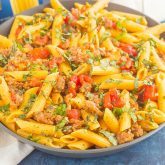 This is one of my favorite, easy meals! This looks like the perfect easy dinner idea! I also think it is just light enough that it is perfect for summer! And cheers on moving to your new place! Whenever I move the kitchen is always one of the first things to get organized! So exciting about your new house! This looks like a great meal for busy nights! Another great recipe to try. My favorite pasta shape! Thanks also for the basil pesto recipe. BTW, I have made the honey garlic chicken - fantastic! I added a couple drops of Sriracha, just to give it a little "bite". Isn't cavatapi pasta the best? It's my favorite shape, too! :) And I'm so glad that you liked the honey garlic chicken. I will have to try adding sriracha the next time I make it...such a great idea. Thanks for sharing and having a great weekend, Jeannie!